AF/Armaflex Class O is the professional insulation for reliable and continuous condensation control. Its structure makes the product easy to install with no vapour barrier required. The combination of a low thermal conductivity and extremely high resistance to water vapour transmission prevents moisture ingress and energy losses and lowers the risk of corrosion under insulation. The built-in Microban® antimicrobial protection and the fire performance make the item especially appropriate for use in process sectors and buildings. The Class O family including pipe supports, Armaflex Protect fire sleeves and adhesives offers a complete solution for all aspects of application. 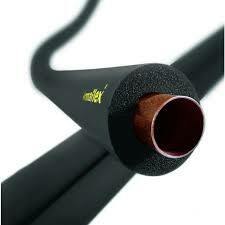 AF/Armaflex Class O Pipe Insulation is fibre free dust free and CFC free with an ODP of zero. Its inherent characteristics and combination of properties makes Armaflex a way of insulating hot and cold water services, chilled water lines, heating systems, air conditioning ductwork and pipework for condensation control, energy conservation and frost protection.